True triple shooting results in all tillage systems using Exactrix generated NH3 and Yetter ITC tool bar. 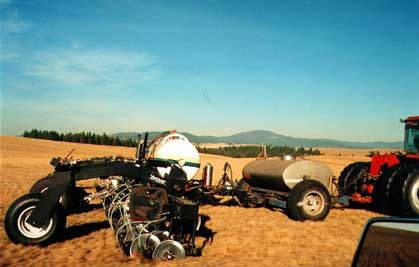 The above photo was taken dynamically fertilizing bluegrass sod for seed production. This is an "on the go" snapshot of a 30 foot Yetter ITC tool bar with 2995 openers using the Exactrix direct injection NH3 system. Tool bar weights were added. 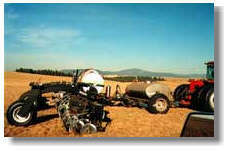 The tool bar mounted NH3 tank stores 500 gallons and uses liquid transfer delivery. The bridge cart carries 1,000 gallons of 10-34-0 and nitrosol. Band centers are 12 inch, depth of placement is 4 inches. Ground speed is 6 mph. rate is 120 lbs. N as NH3, 40 lbs. P, 10 lbs. S, as 10-34-0 and Nitrosol. Absolute minimum vapor loss observed by Wilbur/Ellis, the fertilizer dealer and machine owner. Foam markers were installed to confirm the mark from the previous pass. The white streak is the foam. 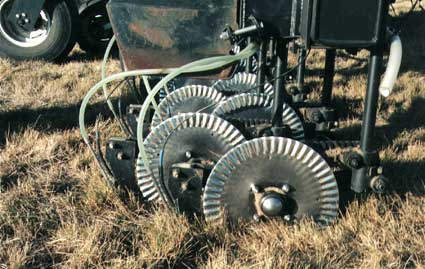 Wilbur/Ellis utilizes this arrangement in difficult residue loads found in No-till as well as inversion tillage systems. 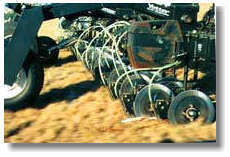 The Yetter 2995 with the rear radius knife is not recommended in mulch till systems. The Exactrix injector foot can be installed in the system. 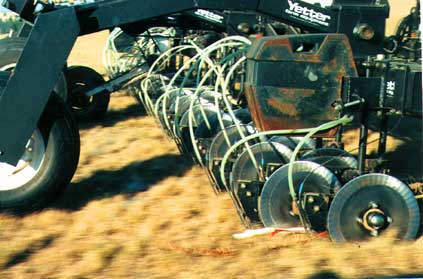 The Yetter Viper series openers are recommended in mulch tillage systems. This is a dynamic snapshot of the Exactrix system combined with the Yetter openers. 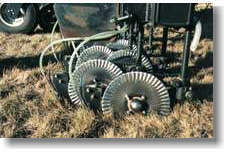 Previous approaches in sod fertilization were accomplished with top dressing. Top dressing resulted in more expensive nutrients, residue and sod tie up of the top dress Nitrogen, poor geometric access to the non mobile phosphate and nutrient runoff in the streams due to the "tin canning" effect of the sod cap.